The kids are done school until the new year, your Christmas baking is now complete (if you’re like me…probably already eaten too) and kids are eagerly awaiting Santa’s arrival. With a couple of weeks off school, do you have family activity ideas in mind to keep everyone entertained during the holiday break? Yesterday was my husband’s first day off for the holiday season so we celebrated with one of my little guy’s favourite activities – the arcade. He has no idea how to play the majority of the games but he still loves it. I think we’re going to try bowling for the first time too. Did you know that when you go with a child they can put up those bumper pads to prevent gutter balls? Finally – a chance for me to actually score some points! Other than playing with all those new Christmas toys, here are some fun ideas for keeping your family entertained during the holiday break. Sometimes I feel like one of the last people that actually sends Thank You cards but we still have a tradition of sending personalized cards after Christmas. Now that my son is old enough to participate, we’re turning this into a craft activity for him. Is your Christmas tree loaded with ornaments? We have a free printable Christmas Tree Scavenger Hunt game that all ages can play. Have you eaten enough cookies to last you until the new year? There’s no such thing as too many cookies, right? Decorate some countdown cookies with your kids to use at your New Year’s Eve party – like cookie clocks or numbers counting down the hours until the new year. Speaking of New Year’s Eve, there are so many fun crafts that you can do as a family to prepare for a little party at home: make your own party hats, use empty toilet paper rolls to make confetti poppers, see what supplies you have around the house to make your own noisemakers. Plan a family slumber party where everyone sleeps in sleeping bags in front of the TV with popcorn, treats and movies. Bring a flashlight to make shadow puppets, drag out all the bed sheets to create forts and have a movie marathon in your coziest pajamas. Have you rented a movie from Redbox yet? It’s incredibly easy! 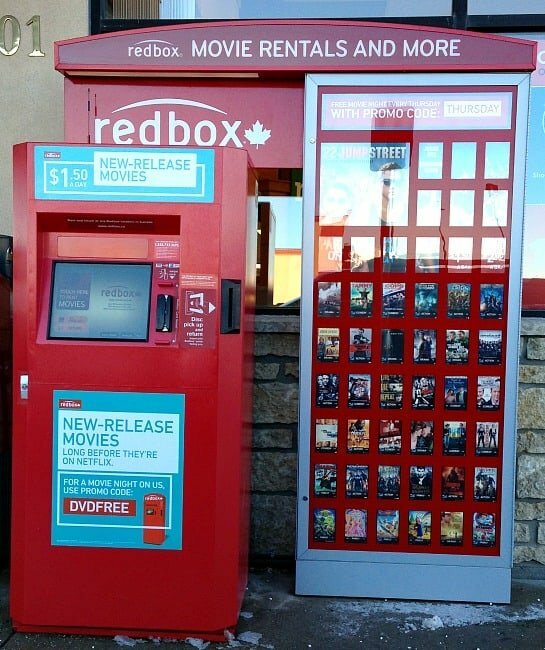 Simply visit Redbox.ca, choose a location close to you, select a movie to hold for pickup, go to the Redbox and swipe your credit card to get your movie. DVD rentals are only $1.50 so it’s a great, affordable option for family fun. You can choose from the latest releases or one of the Christmas movies like: Arthur Christmas, 12 Dogs of Christmas, The Smurfs Christmas Carol and more! There are some great options both for a family movie night or date night with your spouse. Don’t forget the snacks – here are some Salty Popcorn Recipes and some Sweet Popcorn Recipes that your family is sure to love. From my family to yours, have a happy holiday season!